I've had this French chair with a wicker back and upholstered seat in the works for a long time, since November last year and I'm finally happy with the outcome. I bought this little chair at auction and it was in a sorry state. The wicker was all discoloured, the upholstery was filthy and the wood was not looking too good. I painted the chair with my home-made chalk paint, waxed it and reupholstered in it a drop sheet. I thought it was a little bare and bland so I never bothered to add the trim as I knew I wouldn't leave it as it was. 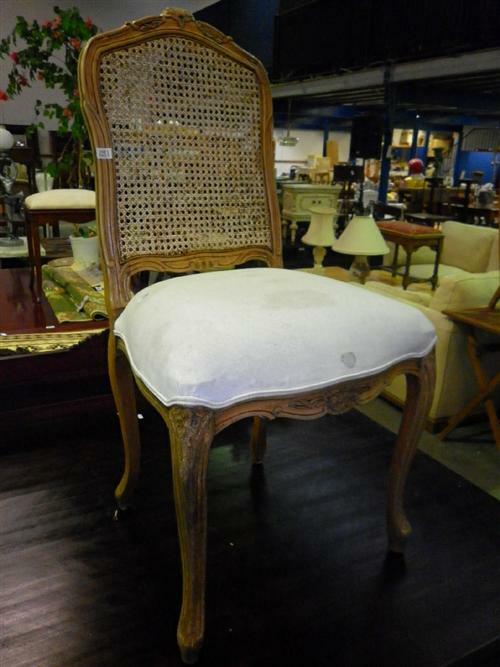 Then in January I bought a Paris stencil from Maison de Stencils and thought this chair would be a good candidate. The stencil is lovely and cost $40. Maison de Stencils has a fabulous range. go check them out here. However I didn't like it. I thought it was a bit too tacky/try-hard. Really not my style. So I finally worked out what I needed to do. I've not seen this done before and I am beyond happy with it. This was quite time consuming - all afternoon - but I was able to use a drop sheet I had on hand. The colour of the drop sheet perfectly matches the paint I've used on the wood, but the woven pattern gives it some interest. I even made my own binding using the sewn edge of the drop sheet. To ensure that the woven fabric doesn't pull apart, I've used a little glue from the glue gun along the joins. The glue isn't visible but it will mean the weave will be durable) and will be safe from prying little fingers. To make the trim I just rolled up some a strip on the edging seam of the drop sheet and then glued it together and then glued it on to the chair. It looks great! The corners were very tricky to get looking good especially as there was a lot of material to deal with but I think it's turned out okay. I'd love to hear about some of your projects that have taken a long time to get right. Come on make me feel better about how long this has sat in the corner of our bedroom half finished! So cool, I reckon that this post is going to go all around blogland! thanks Karen, well that would be exciting! I've been thinking about doing this for months now but it's taken me a while to get my head around how I would do it and also to get time to do it. but I really love it. I've been in the upholstery biz for 35 yrs and think this is so cute. Drop cloth is popular for slipcovers and I'm looking forward to doing this on some dining seats. Like that you used edging instead of double welt. oh i totally love this solution! it's creative and has great texture! Thanks Cassie. I like the texture of it also. Worth the effort, especially when I'm keeping it for our house. Genius idea for the weaving! It looks just right! Thanks Marita, I've been thinking about it for months, working out in my head how I could do it all neatly and nicely. Soooo attractive! How did you make the stips that your wove together? Hi Janie - thanks, I ripped up drop sheet and folded it. I'll do a tutorial in the next few days. I love the revamp! The basketweave cushion is gorgeous! Hope you'll link up to my party! It really does look beautiful - and you did a great job! Those corners are perfect! thanks Catherine - and thanks for noticing the corners, LOL. They took a lot of fiddling! thanks Adrianne! much appreciate you stopping by and commenting. have a lovely weekend. Absolutely gorgeous! The weaving really adds fabulous texture and pattern. thanks Aimee, it really changes the chair completely doesn't it! Oh my gosh this is amazing and absolutely gorgeous. I mean, I have to admit the stenciling was quite nice but this basket weave is elegant and brilliant. Thank you for this wonderful post! I would love it if you would share this at our What’s It Wednesday blog party. Hope to see you there. thanks Paula -i'll link up. much appreciate your comment. Love it, Fiona! Very creative and unique with the basketweave design. I like how you did the "cording". Wow, this looks great. Very pretty .I would love for you to stop by My Dream Canvas. You did such a beautiful job on your chair. I never would of thought of weaving drop cloths. Thanks for sharing. thanks! I love how much texture and interest it adds. This is AWESOME! And I totally love the look, the texture....LOVE IT! thanks Lou Cinda, I'm going to do another one with a tutorial so stay tuned. Happy Easter. I absolutely LOVE the weaved fabric on the seat. The chair looks amazing! Great job! I love the look of this chair! The weave of the fabric really makes it stand out. Great job! thanks Taylor. - linked up now. thanks Tania. much appreciate you stopping by and commenting. I really love the chair now and I've used the stenicl on other things and it looks much better! Wow! That is a really fantastic seat cover! The entire project is beautiful, but I love something a little different and the woven seat is awesome! That looks great. I will be featuring it tonight at my Swing into Spring party that opens at 8pm EST. Please stop by and pick up an I've Been Featured button. Thanks so much. What an awesome idea! I am pinning this for future inspiration! Thanks for sharing. thanks Karianne for commenting - sorry for my slow reply! much appreciated. I love the way the weaving looks! As I sat here staring at it I thought it would look fantastic to do this on a bigger scale on an accent wall! Hmmm.... How can I pull that off! I can see it in my minds eye but not to sure how I can do it! Thanks for inspiring me! thanks LL, it would look amazing on a big scale. if you do something can you please send me a picture? I am glad to be able to inspire you! I love the weave, it is so different. It really looks great! thanks Tina - I am so in love with this chair. LOL. it makes me smile every time I walk past it. Wow, I love this...it's just beautiful! I adore drop cloth have always loved the "woven look" It's amazing what you have done with this chair - you have truly taken it from trash to treasure! I have an unfinished woven pillow that you have just inspired me to finish! Thanks so much! thanks Mimi and welcome to Lilyfield Life! I am so in love with this chair even a few months later. It's in our bedroom and I see it all the time but appreciate how it looks still! I'd love to see your pillow when you've finished. can you send me a link?